In the last five years I’ve been at Commencement Day at universities around the world – a few times to receive awards and three times as the commencement speaker. 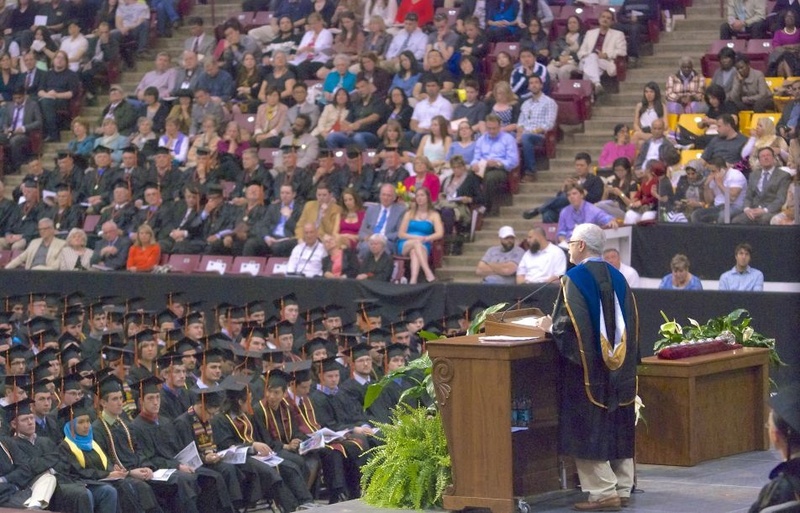 But attending both my daughters’ college graduations this year helped me to see how things look from the other side of the podium. First, college graduations fall in the category of “life cycle” events. At some major events– your birth and death for example, while you may be the center of attention, the events are managed by others and are more important to the people around you. Other events, like coming of age celebrations, getting your driver’s license, getting married, the birth of your children – are more important to you, and those attending are the celebrants at your event. While our daughters’ graduations felt important to us, on top of mind was that this day was about honoring their accomplishments not ours. We were there to celebrate with and for them. And we were incredibly proud of what they achieved – through their years as college students, they grew smarter, wiser and more prepared for the world in front of them. Second, for most students, our kids included, college was a halfway house to independence. The morning they stepped onto campus as freshman it was the first day of their own life –they were no longer just a child of their parents. College was the first place they could taste the freedom of making their own independent decisions – and in some of those “mornings-after” – learn the price of indulgence and the value of moderation. At school they had their first years of taking responsibility for themselves. While it may not be obvious to them yet, their college years were a transition from having their parents make decisions for them to making decisions for themselves. Through those years, we lived through a few crises, tried hard not to be helicopter parents and helped when we were needed. That brings up my third and final observation. At the commencements I attended, graduates were classified by their academic rankings. Outstanding academic performance was noted in the programs and awarded with special honors. Schools reward their students for a combination of intelligence, perseverance and hard work, in the classroom and on the playing fields. But these metrics don’t help kids understand that great grades are not a pass for a great life. How many of those “A” students will find that after their first job, few employers care about grades and customers don’t ask for your transcript? In fact, in a decade or two, a good number of those “A” students may well be working for those supposed losers who barely graduated. It’s at the back of the hall where there were a few who see things differently. Who have no fondness for rules or respect for the status quo—these are the kids who are more likely to grow up to create new companies and new industries and push the envelope in directions not visible to those who follow a more conventional path. Successful founders and technology entrepreneurs have at best a zero correlation with great grades. Colleges may not reward resiliency, curiosity, agility, resourcefulness, pattern recognition and tenacity. But as an entrepreneur, they matter a whole lot more than following directions, playing by the rules and getting top grades. Congratulations to those in both the front and back of the room. Your lives are going to be interesting – through very different paths. Study hard for a great grade helped to develop discipline and patience- absolutely necessary ingredients for a meaningful life. Furthermore, the pursuit of good grades is a pretty good dress rehearsal for effective time management and delay in gratification. Ideally, you don’t want to learn those lessons on your first job. I was in both the front and back of the room as a student. life was hard in both places. I did earn something valuable when I managed to get good grades: self confidence.